What a lovely bunch of coconuts! Summer, you brute, where have you gone? I'm hoping this chill is a temporary blip. But just in case, I've inject a little sunshine into my home via the most summery of fruits… the coconut. 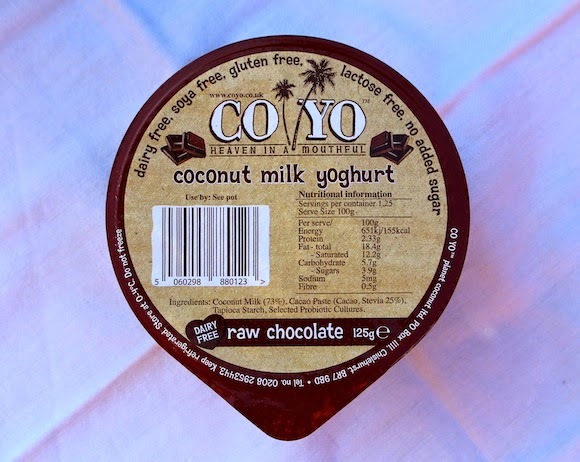 CO YO is a vegan, dairy-free yoghurt. But wait! You don't have to have a dairy intolerance to enjoy these utter beauties. I tried three different flavours and would have photographed them all, if one hadn't dropped on my kitchen floor when I got too excited about my delivery. Because oh what a lovely bunch of coconuts! CO YOs are rich, creamy and feel like a major treat even though you're eating all good things… They are made from coconut milk and some probiotic cultures to make your tummy smile. My favourite was the Raw Chocolate one. Made using cacao powder, it's indulgent with that sharp, grown up taste you get from raw chocolate. I really enjoyed the Natural coconut ones too, that tropical coconutty taste makes you feel like you could be on a beach in Thailand. The makers call these 'heaven in a mouthful' and for a mid-week treat when you're feeling saintly, they are perfs. There's an ENTIRE COCONUT in each pot, though you're meant to eat 100g of the yoghurt. This seems odd as they come in 125g pots and there was no way I was syphoning off 25g of the goodness to stick to my recommended allowance. On a coconut trip, I decided to give coconut water another go. I'd tried one brand before and found it pretty gross. But then I stumbled across the wonder that is Go Coco in Waitrose. It's made from pure coconut water alone and tastes kind of nutty and a tiny bit creamy. Basically, delish. Plus, you don't need me to tell you how ruddy brilliant coconut water is for you. Ridiculously hydrating, amazeballs for a hangover, good for your skin, hardly any calories… You know the score. I've been merrily quaffing this beauty of a drink for weeks and I'm hooked. It's especially refreshing after a bit of exercise or after one too many glasses of wine, which basically means that it covers all of my favourite things to do. So to summarise, I'm possibly high on coconuts right now. Coco keen? 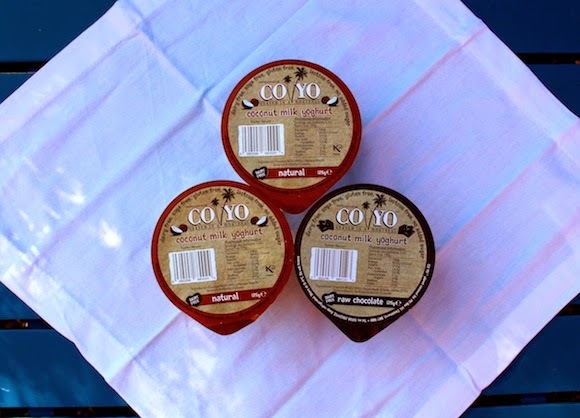 Find CO YO in Tesco and Go Coco in Waitrose.